The MSC Apex Computer-Aided Engineering Simulation Platform now allows users to import MSC Natran model, edit/modify mesh topology, attribute the model, create scenarios and generate ready-to-run Nastran file. It enables FEA engineers to assess the model’s response and improve day-to-day efficiency. The new workflow helps users to improve pre/post processing productivity by up to 10 times. The platform is embedded with direct-modeling technology and automation scripting capability. NEWPORT BEACH, Calif., January 16, 2019 (Newswire.com) - MSC Software Corporation, a part of Hexagon, today announced the latest release of MSC Apex, the company's award-winning Computer-Aided Engineering (CAE) simulation platform. The latest release, Iberian Lynx, enables enhanced interoperability between MSC Apex and MSC Nastran, by combining the world-class CAE user experience of MSC Apex with the industry's most trusted multi-disciplinary FEA solver, MSC Nastran. "Iberian Lynx is a milestone release for MSC Apex. 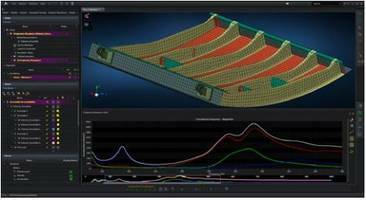 It now allows MSC Nastran users to fully leverage the efficiency and experience of MSC Apex modeling and results processing," says Hugues Jeancolas, VP of Product Management at MSC Software. "While many of our customers have chosen MSC Apex for its ease-of-use and integrated FE solver to deploy simulation solutions to non-specialists, we found that this MSC Nastran interoperability approach helps us deliver 10x productivity to expert users for a wide range of benchmark test cases. This is a major step forward and I encourage all MSC Nastran users to take advantage of this exciting workflow enhancement."